(RED) recently announced a collaboration with electronic dance music pioneer, Tiësto. 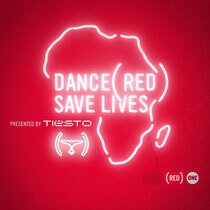 On November 27, Tiësto will release an exclusive compilation album, ‘DANCE (RED), SAVE LIVES’, followed by a global live stream – powered by YouTube - from Melbourne’s Stereosonic Festival over World AIDS Day weekend on December 1st and 2nd. The compilation features artists including Calvin Harris, Avicii and Diplo, Laidback Luke, Martin Solveig as well as an exclusive collaboration between Tiësto and Bono on U2's 'Pride'. Mobilizing the huge global community of dance music fans in the fight against AIDS, Tiësto and his fellow ‘DANCE (RED), SAVE LIVES’ artists will, for the first time ever, live stream their sets from the Stereosonic Festival on YouTube, bringing fans an unforgettable live global music experience. The stream will be available at www.youtube.com/joinred. Richie McNeill, Managing Director of Totem OneLove Group, said; "We are really excited to have Stereosonic involved in such a great cause. AIDS is one of many things we should all aim to help research and destroy, and (RED)’s mission to fight AIDS in Africa is a noble one we are simply honoured to be a part of. If by music we can spread the word with the generous support of the DJs, artists and record labels, then we will! Big thanks to Tiësto, Complete Control Management’s Josh Neuman and the (RED) crew for inviting us to be a part." In addition to being on YouTube, the live stream will be available throughout World AIDS Day weekend across the web on leading sites such as Rolling Stone, Mashable, Huffington Post, Wired, Thrillist, VEVO and on Converse's Facebook page. Promotion for the DANCE (RED), SAVE LIVES campaign includes a pro bono media campaign by Hill Holliday, across leading digital platforms, television networks and print publications including Twitter, IFC, A&E, Los Angeles Times, AOL and Klout.